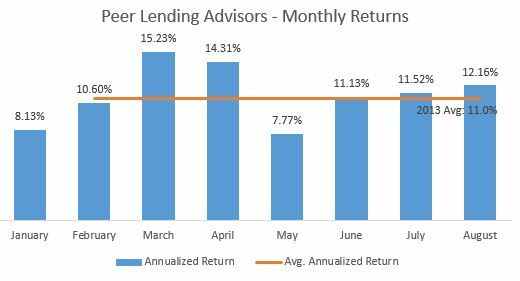 Peer Lending Advisors had another great month in August. Below you’ll see net returns, which reflect interest net of losses. The returns reflect the entirety of loans acquired, and as purchased ramped up in 2013, the portfolio has become more heavily weighted toward newer loans, which have a different charge-off curve than seasoned loans. Please note that past performance is not a guarantee of future results. August was another great month earning an annualized return of 12.16%. This brought the average return for 2013 up to 11.00%. Returns have been trending up for the past three months. Expect the remainder of the year to see returns similar to those experienced the past few months. One risk on the horizon is the impact of the slowing housing market. While Peer Lending Advisors has stayed away from borrowers in the construction industry, the impact of the slowdown of housing (and housing remodeling) will certainly drive some loans bad. Expect the short-term impact on the portfolio to be minimal, and remain cautious long-term. Lending Club is poised to have an IPO next year. I wondered, will owning stock in Lending Club be a good investment, particularly at the IPO? For this post, I’ll cover Financial Services IPOs in general, and in a future post I’ll look at the merits of a $1 B potential market cap for Lending Club. 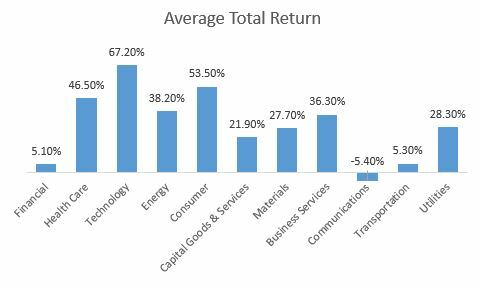 However, Financial Services IPOs had the 2nd lowest total return of any industry. Over the last 12 months, Financial Services companies that IPO-ed returned just 5.1% to investors. When considering investing in a Lending Club IPO, proceed with caution. 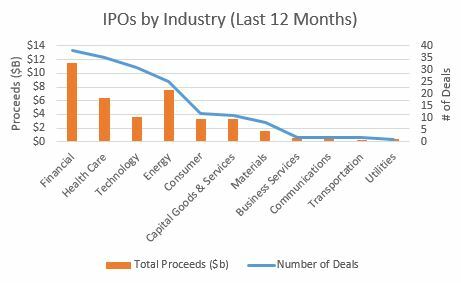 Not all high-profile IPOs have delivered for investors, and Financial Services IPOs in general have garnered a fairly cold reception. 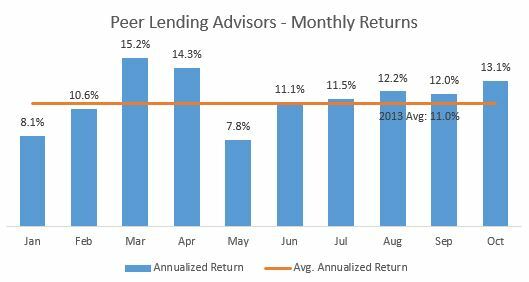 Peer Lending Advisors had another great month in July. Below you’ll see net returns, which reflect interest net of losses. The returns reflect the entirety of loans acquired, and as investments have ramped up in 2013, the portfolio has become more heavily weighted toward newer loans, which have a different charge-off curve than seasoned loans. Please note that past performance is not a guarantee of future results. July was another great month. Annualized return of 11.52%. This brought the average return for 2013 up to 10.91%. 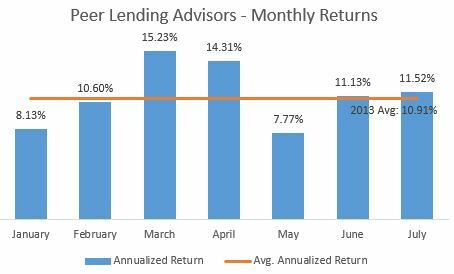 Peer Lending Advisors changed its credit policy in January and reduced our activity on the secondary market. Previously, the secondary market was being used to help supplement purchases of loans as investments were ramping up. However, the credit model couldn’t evaluate the credit worthiness of borrowers as effectively as on new loans due to older credit information. In January, Peer Lending Advisors stopped making purchases and wrote down several of the loans in the portfolio. Beginning in May, some weakness was observed in existing loans purchased on the secondary market, so continual write-downs are being made when weakness is observed. Estimate that these loans have had ~100 basis points of impact on the portfolio in 2013, and anticipate another ~100 basis points of writedown through the rest of 2013 as these loans continue to run-off. 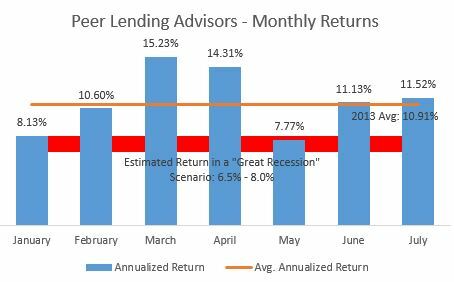 Each month Peer Lending Advisors runs scenario analysis to estimate how the portfolio would hold up in a recession scenario. The toughest recession scenarios are examined to ensure the portfolio would hold up and remain, at a minimum, net neutral with no capital loss. Note that there are no guarantees. Estimate that the return would remain strong in a recession similar in size to the “Great Recession” of 2008, and drive annual returns between 6.5% – 8.0%. This is tremendous performance, considering most asset classes would experience huge capital losses. For example, the S&P 500 lost over half its value in 2008, and home prices declined 50% in some areas. Peer Lending Advisors doesn’t invest in high risk loans specifically because of the risk of recession. While focusing on E-grade loans and above could goose short-term returns (you’ll see many bloggers brag about high returns in this category), on a risk-adjusted basis, many of these loans are junk. Interest rates would need to be above 40% to make many of these loans profitable in the long term. Could you imagine if the default rate on these loans merely doubled? Lenders would be under water. Peer Lending Advisors triple and even quadruple losses in some scenarios to ensure portfolio resiliency. Peer Lending Advisors will continue to stay out of this market, which will make short-term returns appear lower, but strengthen the resilience of the portfolio. Peer Lending Advisors manually underwrites every loan, which includes reviewing every borrower’s employer and ensuring they have a steady job. A basic guiding principle is that people with unsteady jobs (think minimum wage and high-churn jobs) have higher default rates, and people with secure jobs (e.g. secure employers like the government and highly skilled jobs) have lower default rates. The models prove this out. The impact of employer is a complicated question, and for the purposes of this post, I have massively simplified the analysis by isolating the impact of employer and restricted the data set. To demonstrate the impact of employer, I looked at loans that were issued from May & June 2011, and looked at the % of loans that were current or paid-off for various employers. Bank of America: Retail banking is a very high-turnover industry. While it takes some education to work at Bank of America (BOA), tellers are paid poorly and typically don’t enjoy their job, which results in high turnover. I am very cautious with employees of BOA, Chase, or the other big banks. And the data proves this is a wise decision: only 2/3 of borrowers from BOA are current after two years for the selected data set. Walmart: Everyone knows the struggle that employees at Walmart go through. 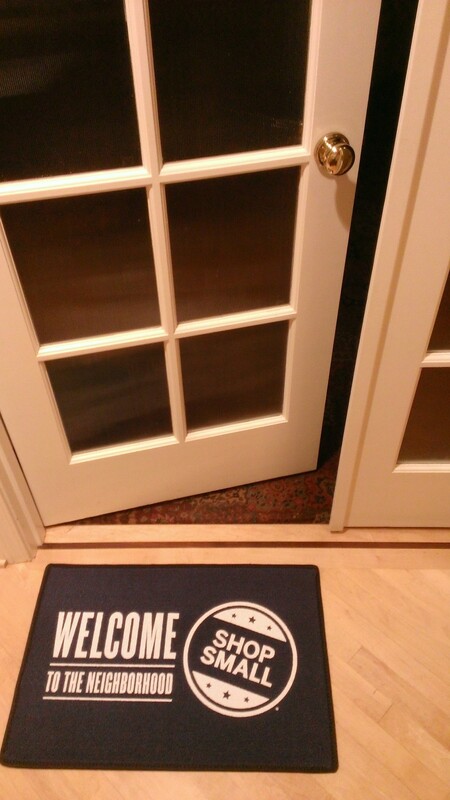 Unionization is prohibited, and employment is tenuous. Only 4 out of every 5 borrowers are current that work at Walmart after 2 years of borrowing at Lending Club. Peer Lending Advisors is very cautious before investing in loans for employees at Walmart, despite supporting the efforts of all people to refinance their debt at lower interest rates and improve their credit and employ-ability. Blank: Some borrowers don’t list an employer. Some of these borrowers are self-employed. Others choose not to share employer information. Peer Lending Advisors treads carefully with these borrowers, looking at supplemental information before deciding to invest. Total disclosure is preferred – loans that include full information about employer and the uses of funds are most likely to pay back their loan. Indeed, people that leave employer blank are more likely to default than average. 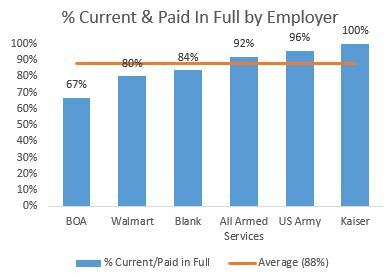 Armed Services / US Army: Contrary to the examples above, employees of the Armed Services are much more trustworthy; employees of the armed services have a very low default rate. In particular the US Army is highly likely to pay back loans. This is not surprising: the military teaches discipline and pays well, and members of our armed services often work hard to get on the right track. This is not the case of all government employees: for example, the USPS has slightly below-average repayment rates, so it’s important to review risk and employer. Kaiser Permanente: Peer Lending Advisors loves healthcare jobs. Kaiser certainly proves this, with 100% of loans paid in full or current after 2 years. We review all jobs and attempt to isolate healthcare jobs, which often are reflected with perplexing acronyms, which can only be solved by searching and using relevant information in the loan application (such as city). With the huge population of baby boomers currently reaching social security age, this segment will continue to yield high job security and positive returns in Peer-to-Peer Lending. For simplicity in the above analysis, I ignored risk and did not adjust returns for risk factor in the above analysis. Did it have an effect on returns? Risk-adjusted distribution of loans shows that this analysis still stands. 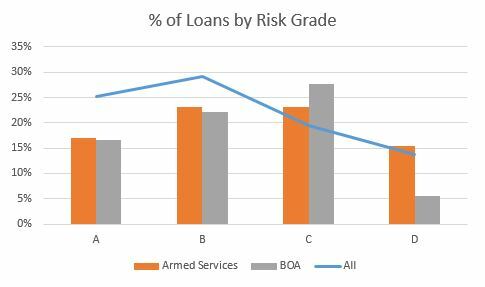 Armed Services loans have a much higher proportion of “D” loans (along with a higher interest rate) than “A”, “B”, and “C” loans. This means that while Armed Services Loans have a lower default rate, they also have a higher interest rate. This is best-case scenario! Clients of Peer Lending Advisors benefits doubly from this: higher interest rates and lower default rates. Interested in working with Peer Lending Advisors and lending peer-to-peer? I am currently very behind on my rent (due to previous financial issues) and I am facing eviction. I’m in desperate need of help. I can now make my rental payments in full as of next month. With the additional context, the loan has a much different risk profile. A payday loan provider might consider loaning this person the money at triple-digit rates, but a 17.27% interest rate is not sufficient (in my opinion) to cover the risk of the loan, despite the favorable credit metrics. Will this loan pay in full? Perhaps. But the point is that the return is not worth the risk. 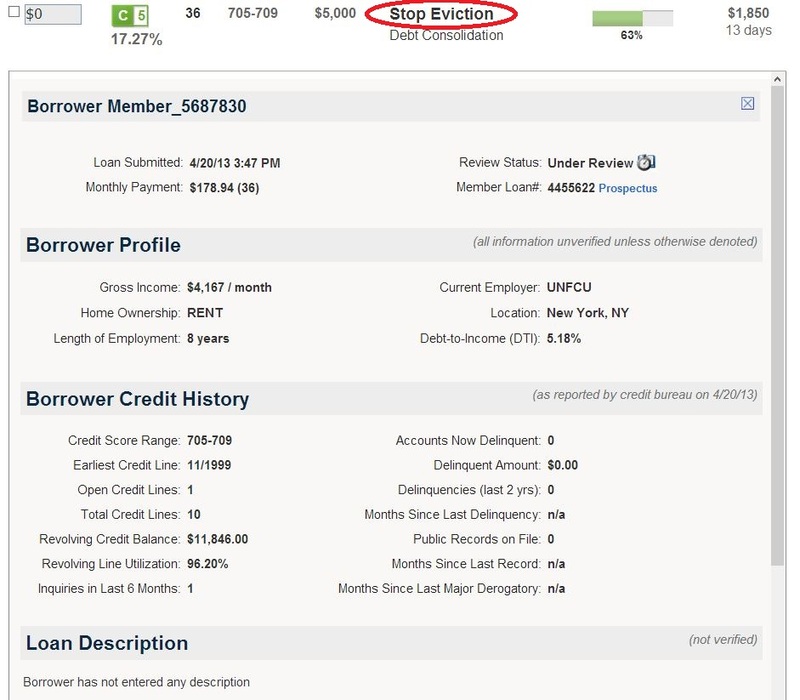 Someone who relies on automated investing tools, pure algorithms, or even pooled funds could get stuck with loans like this. With Peer Lending Advisors, this type of loan will never appear in your portfolio. Interested in investing with a pro? If you invested in the Dow 5 years ago, you’d have made about 32% on your money. Not bad. However, if you’d have managed to avoid the 5 biggest daily declines for the Dow, ranging from 4-8% losses in a single day, you’d be up much more than that. The 5 biggest declines totaled 36%, making your total return 68%. Avoiding the down days is actually more profitable than buying and holding over 5 years. How do you avoid the biggest daily declines? It’s virtually impossible. 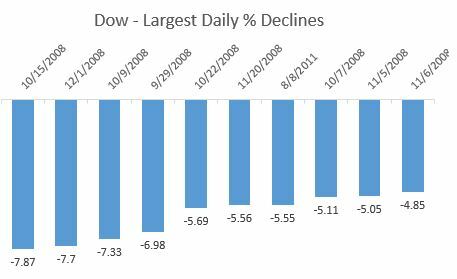 Many of the biggest declining days were next to the biggest jumps in the Dow. For example. 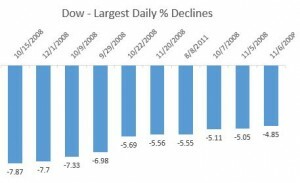 The biggest gain for the Dow in the last 5 years, October 13th, 2008, was 2 days before the biggest daily decline, October 15th, 2008. How many people were all-in on the 13th, but cashed out by the 15th? Not many. And you would have been foolish to stay out of the market after the 15th – on October 28th the Dow was up another 11%. The lesson is that timing the market is impossible. Experts use techniques such as dollar cost averaging to spread buying over time to try to even out the randomness and volatility of the markets. In Peer-to-Peer Lending, there’s no timing the markets. You invest in loans with a 3 year duration, and typically hold until they mature (there is the option to sell the loans on the secondary market). Investing money over time still makes sense, but there’s much less volatility – there are no down days and up days. In Peer-to-Peer Lending, if you select the correct loans to invest in – the ones that will pay back their loan in full, and avoid the loans that will default, you’ve effectively “timed” the market, but in a much better way. For example, if you invest in “C” loans that typically pay 15% interest and the average return is 10%, 5% of the value is lost to default. However, if you’re able to avoid half of the defaults, your return increases 25% to 12.5%. Add up the returns over 5 years (including the effects of capitalized growth), and you come up with some strong returns numbers. The base case – 10% returns, gives you a 62% return over 5 years – much better than the Dow alone, but not quite as good as the Dow excluding the 5 biggest declining days. 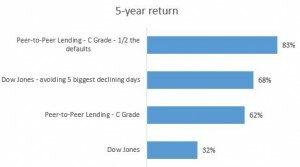 However, the 5 year return for the example, low-loss case in Peer-to-Peer Lending – essentially cutting your default rate in half – is a whopping 83% over 5 years. Again, this return is higher than the Dow + the impact of magically avoiding the 5 biggest down days in the last 5 years. How do you select the right loans in Peer-to-Peer Lending? You could try to build your own model to analyze past loan performance and predict future performance. That takes time, money, and expertise. Or, you could entrust the job to the only Investment Adviser focused 100% on P2P Lending – Peer Lending Advisors, having already done the work for you, so you can leverage the model and manual underwriting processes.